I have been trying to organize my collections photos. One key part of that is transferring content into the computer where tagging, captioning, and annotation is easy. Getting the photos into the computer satisfactorily has proven to be a challenge. For many pictures the only sensible alternative is to send your pictures to a professional scanning organization. In an hour you can only scan about 32 photos, extrapolating to scan everything is depressing. Nevertheless, I want to digitize some images myself because they are fragile or because they are not organized enough to send away in a coherent manner. I struggled recently with two pictures. Neither is a great photo, nor are they extremely important to me, though I have fond memories of the times and places they were taken. I first scanned with my flatbed scanner, an Epson Perfection V100 Photo. 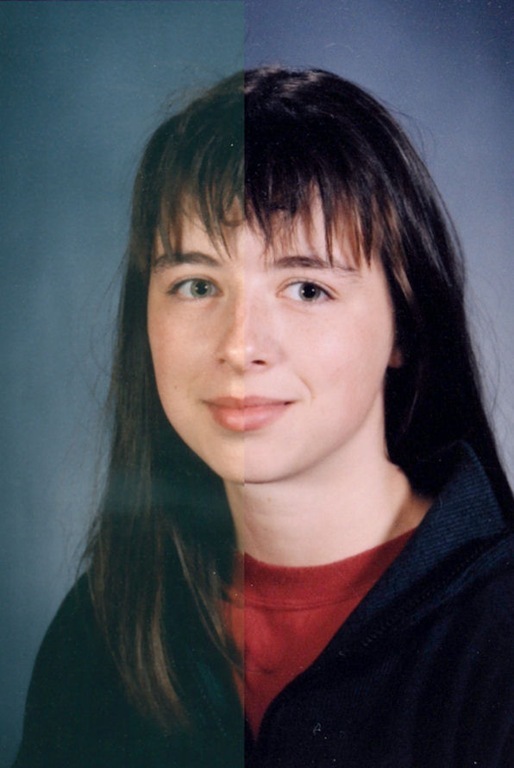 The scanner produced unusably bad results on glossy photos and on textured photos. I have read that texture problems can be defeated by scanning a photo, rotating it 180 degrees, and scanning it again. Then, registering and blending the two photos will help remove the specular reflection (bright marks) from the texture. In my experience rotating and registering two photos like that would require lots of work. Such techniques do not help with glossy photos. Another technique is to use a camera and copy stand. With proper illumination and careful color control a copy stand should be able to get rid of most of the texture reflections and surface haze. It can be much, much faster too—you can digitize as fast as you can change pictures. The following two comparison shots show the problem and the improvement available by using the copy stand. In the first one the picture has a dreadful haze, even after being cleaned with PEC-12 and PEC Pads. The copy stand solution is superior. The next photo shows a textured print that left an orange-skin texture of bright white micro-lines in the scanned image. I processed this with a “small scratch remover” filter in Corel Paint Shop Photo Pro X3. I believe that filter is simply a median filter, and I do not like the artifacts it leaves. Not all of the texture was gone using the copy stand. But the haze was, and enough of the texture was removed to produce a much more pleasing result. Copy stands, purpose-built, are quite expensive. 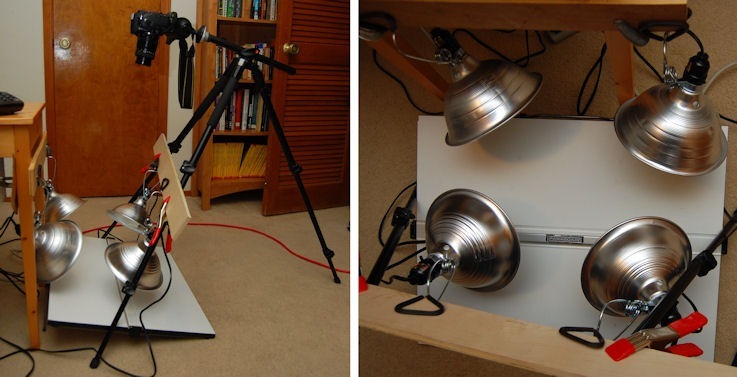 I created my own with four lamps, a tripod, and some clamps. It is fiddly to set up and miserable to change photo size because I have to move the camera closer or farther away. Still, the copy-stand only materials cost less than $30. The people in the pictures will remain anonymous, unless they wish me to share their names, or of course, remove their photos.